Don’t fall for gorgeous looks! Beauty is within. The modern world portrays Montessori as a fancy method of education for privileged children. 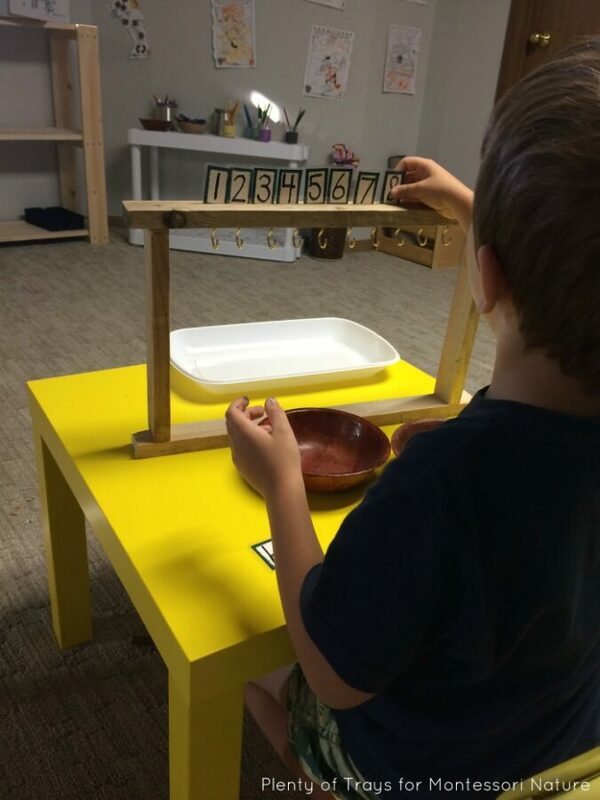 In its essence, the Montessori method is not about the status or gorgeous classroom interiorioir. It is about meaningful connection, respect and authenticity. 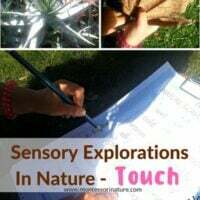 However, Montessori is also about hands-on experiences and thoroughly designed materials. So how do we go about creating a Montessori environment at home with hands-on materials when the budget is tight? 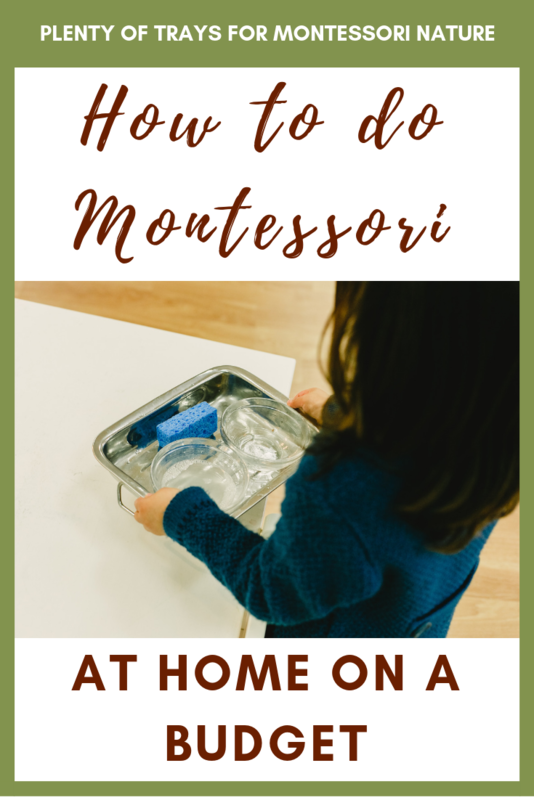 Gabrielle of Plenty of Trays shares her wisdom and great tips to help families make Montessori more affordable on a budget. Social media leads us to believe that pictures can set a certain standard of living. We scroll through endless amounts of pictures of beautiful baby rooms, play rooms, kitchens, living rooms, bathrooms, and wonder what is wrong with our rooms? Why can’t my rooms be that beautiful? I find that it is especially intimidating when you are looking for inspiration for your Montessori-style rooms. You are looking for simple ideas and get bombarded with tons of information and pictures of expensive-looking low white shelves filled with beautiful blue and red and wooden works. Now what? Does the question become: food or shelves? Well, if it does for you, please, pick the food. Then let’s take a breath and start at the beginning. Dr Maria Montessori developed her Method with almost no money. She and her assistants hand-made a lot of the first materials. She does put an emphasis on creating a beautiful and peaceful space but beauty is in the eye of the beholder. Your child doesn’t care about the latest trendy white shelves. He won’t be offended or ruined if you buy the second-hand table and chair with the scuff marks. What is important is the principles behind the method: respecting the child, following their lead, observing their actions, and preparing their environment. So how do you prepare the environment with no money? Honestly, you probably can’t. Take a good look at the things you already own. Do you have some old shelves sitting in the garage? A stool that can help your child reach things? Maybe you have a bookcase filled with things you don’t really need or that you could put somewhere else. Do you have an end table that you can remove a door from that would make a little shelf? For the actual works, so many things can be made with repurposed materials. Bead stringing was a favorite when my boys were toddlers, do you have an old beaded necklace that you never wear? Use an ice cube tray or muffin tin for them to sort those beads by their different colors or sizes. Use different cuts of old fabric, small containers filled with rice or beads, and different spices from your kitchen to develop their sensorial skills. Once you’ve exhausted your own supplies. Visit your budget, identify your priorities and save up a bit to spend on your child. Garage sales and thrift store are your next go-to spots for affordable furniture and supplies. More often than not you will find baskets, bowl, and trays galore! Also, look for child-size kitchen tools and other practical life items, like a small broom, clothes pins, vases, small watering can, and placemats. Garage sales might also be a good place to find art supplies. Lastly, don’t let birthdays and Christmas become an excuse to pile up useless toys. Buy your child a gift that will spark his curiosity and light up a desire for learning. Whether it be a pink tower, animal figurines, small woodworking tools, or a movable alphabet, if you do some research you can find great materials for good prices. Pass along a list of gift ideas to grandparents or other people who buy your child gifts. Maybe a couple of you can get together to buy something more expensive. Just do your best and love your child. Spend time with them, especially teaching them real-life skills at an early age. They will still turn out great without the picture-perfect bedroom. And remember that picture on social media, it was taken before the child entered it. Gabrielle is a young mother of 3 kids. She loves her husband and Jesus, sushi, wine, traveling, and reading. She hopes to inspire parents like you to embrace the Montessori Method at home through her blog Plenty of Trays. There you can find easy and affordable Montessori DIYs, or find her family in action on Instagram, and her huge collection of ideas on Pinterest. To learn how to make DIY Montessori materials visit here. How To Create Gorgeous Montessori Home From The Start. I am a 76 year old retired Middle School Reading Teacher-39 years. My mother’s cousin was Sister Josephina Concannon-the Order of Saint Joseph . She helped bring Montessori from Europe to America.